Ryan finds his freedom in the water, where he is not bound by gravity and his wheelchair. When he rescues his schoolmate, Jack, from the water their lives become connected, whether they like it or not. Ryan keeps Jack’s secret about that day in the water, but he knows that Jack needs help. The school is full of rumors about Jack’s sexuality, and he has few friends. Almost against his better judgement, Ryan decides to invite Jack on a trip to Comic Con he’s planned with his best friend Cody, the captain of the school’s swim team. The three boys make an unlikely combination, but they will each have the chance to show whether they are brave enough to go against the stereotypes the world wants to define them by. This book is one for anyone he loves to read the topics that a lot of authors skirt around. That’s not to say this book is not readable. It’s the complete opposite. Caterpillars Can’t Swim by Liane Shaw is inspiring and heartbreaking all at the same time. Caterpillars Can’t Swim follows Ryan. he is the small town “disabled” guy in a wheelchair from a young age from Cerebral Palsy. He’s on the swim team and has friends and enjoys life. One day he saves a fellow student from drowning. Everyone is talking about this kid, Jack, of trying to commit suicide, being gay, and much more. Ryan, for reason unknown to him, befriends Jack. Ryan’s best friend, Cody, is not as open minded as Ryan about Jack potentially being gay, yet Ryan invites jack to go to Comic Con with them. Throughout the story you watch as Ryan remains open minded, faces situations that make him uncomfortable for no other reason than the fact that it seems to help Jack, and places himself between Jack and those who wish to do him harm. While Ryan, Jack, and Cody took a journey in this book, I found that as a reader I got to go on a journey too. Shaw wrote these characters that are so different from each other, yet found ways to be friends and have things in common. I loved how the topics of sexual orientation and disabilities were broached, yet did not take away from the seriousness of suicide and the struggles that people face when trying to be who they are, yet hide from those they love. So many hard hitting topics were intertwined throughout this novel and yet it flowed seamlessly the entire time. It didn’t come off as shoving these topics in our face as readers, but just helped the understanding of what people go through. Anyone and everyone should read this book. The story had fun moments, hard to read moments, moments that made you tear up, and a final light at the end of the tunnel. Such an incredible book. I wish there was more. Check it out and I will be checking out more of Liane Shaw’s books. 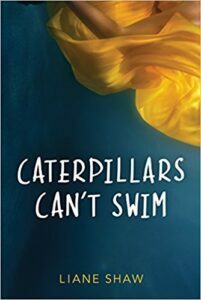 Caterpillars Can’t Swim will be available March 1, 2018 in the US and is already available in the UK. You can pre-order your copy in the US on Amazon and Barnes and Nobles. Upon release, also check your local bookstore. You can add it to your To Reads list on Goodreads to remind you to pick up your copy and check it out in early 2018. You can also check out more incredible books by Liane Shaw on her website here.